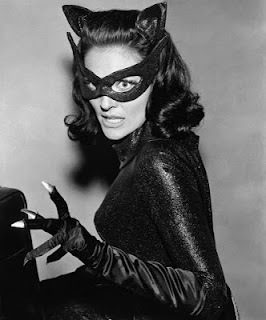 Thus far, there have been six women to play the sultry Catwoman: Julie Newmar, Lee Meriwether, Eartha Kitt, Michelle Pfeiffer, Halle Berry, and most recently, Anne Hathaway. 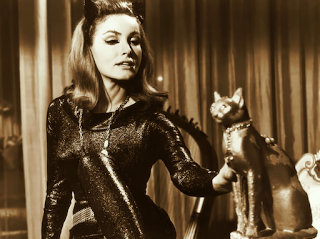 I know there are a ton of posts out there already on "Catwoman throughout the ages" or some such, probably written by people more knowledgeable than I am about the character (i.e. 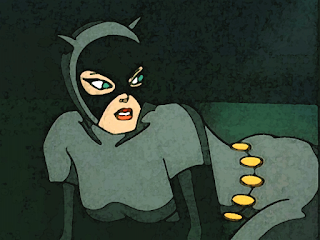 all aspects and incarnations of catwoman, be it animated, comic, film or TV), so this post is more of a fun "best of" kind of deal. Michelle Pfieffer's Selina Kyle. Do I even have to explain why? 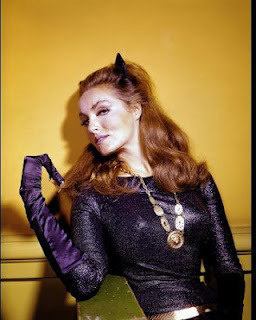 Her Catwoman really made the film. I also wish to add her to the Best Costume list. I remember taking a garbage bag and white thread, in a poor attempt to make my own costume when I was like eight or ten. 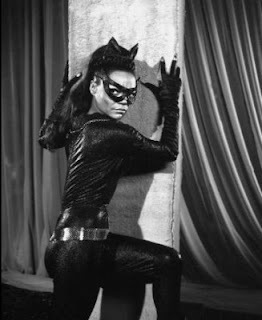 Anyway, any Catwoman had big effin' shoes to fill, and naturally, they have yet to have filled properly. Anne Hathaway's Catwoman. It's true, I deducted some points for having her hair long, flowy and out (which is the same grievous error the Catwomen of the 60s had), which anyone knows that if you're heading out into potential fights, you don't want your hair out as an easy target and point of weakness. At least braid it up. Anyway, really loved how her cat ears weren't really cat ears at all, but goggles. Pretty nifty in costume design, not that I expected less from Nolan. Also, her costume looks a lot more comfortable in regards to fighting gear. 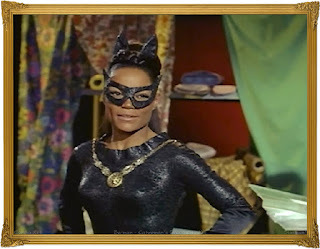 Eartha Kitt, of course. 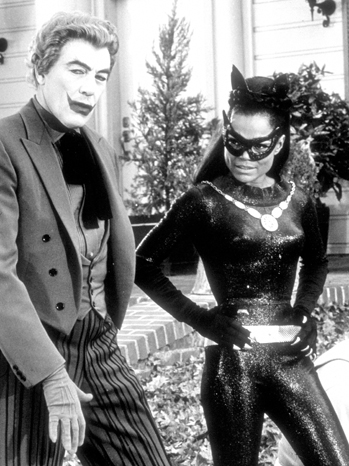 Pfeiffer came pretty close, but Eartha could actually purr. 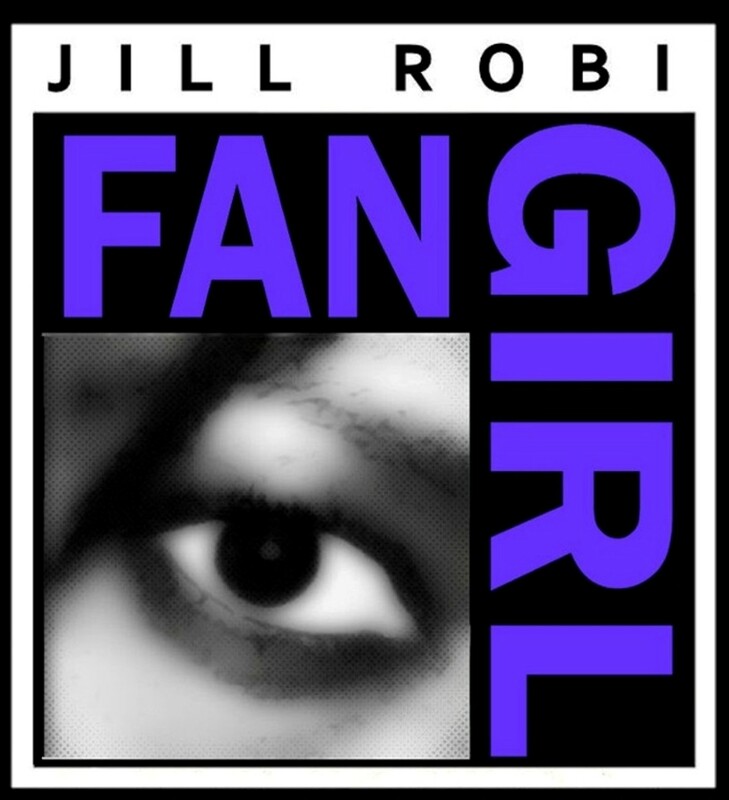 Her voice was unique, and perfect for this heroine. Turns out she was in only five episodes of the Batman TV series (two of those are un-credited), but what an impact this lady made! Honorable mention. Watched this particular cartoon when I was growing up.